More than 100 years ago, a Yup'ik Eskimo used wood, pigment, sinew, feathers and fiber to make a mask celebrating the winds. Now, its striking appearance, rarity and influence on modern art have led its owner to ask what may be a record price for a Native American work. The 34-inch tall "Donati Studio Mask"—known to the Yup'iks as "the mask that brought the south winds," and therefore spring and sustenance—is for sale at the Donald Ellis Gallery in Dundas, Ontario. 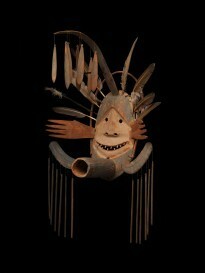 The Yup'iks of western Alaska made elaborate masks for their ceremonial dances, and Mr. Ellis's windmaker mask is one of a dozen bought from the tribe in 1905 by trader Adam Hollis Twitchell. He sold the mask to George Gustav Heye, a collector whose purchases became the core of the National Museum of the American Indian, Smithsonian Institution. But when the museum got into financial trouble in the 1940s, it sold five of its Yup'ik masks. A New York dealer purchased them, for prices ranging from $120 to $160. He resold several to Surrealist artists, including the writer André Breton and painter-sculptor Enrico Donati, both of whom found inspiration in the masks. Four of those five masks are now owned by museums. The most famous of the five, once owned by Mr. Breton, is on view at the Louvre; another is at the Beyeler Foundation in Basel, the private museum established by the late Swiss dealer Ernst Beyeler. It was the famed dealer's only purchase of Native American art. Mr. Ellis says that modern art collectors, rather than Native-American-art collectors, buy many Yup'ik works because of their relevance to 20th-century art. "These are conceptual works of art," he says. The Italian-born Mr. Donati worked in the U.S. for many decades, dying in 2008 at the age of 99. The Donati Studio Mask is by the same Native American artist and has the same provenance as the Breton mask. That's why Mr. Ellis's asking price is set just above $2.1 million, a sum fetched a few years ago for a war helmet of the Tlingit—another Pacific Northwest tribe—at a Connecticut auction. People knowledgeable about Native American artworks generally consider that a record. John Molloy, a rival dealer who also advises Christie's on Native American art, says the Donati mask is a superb specimen. "The influence of this mask and others collected by Twitchell on the group of Surrealists living in New York in the 1940s is immeasurable but undeniable. It's a great piece and deserves to be the record-holder."